Adventure into the deep unknown as you attempt to uncover the secret of the Diamond Cave. Click here to play! Make it out in one piece and you’ll be rewarded for your courageous efforts with massive jackpots! Diamond Cave is an enchanting 5-reel slot played across 20 pay lines, with the more lines opened allowing for more winning combos. The Cave is Wild and can be substituted for any other symbol on the reels, except for Scatters, as well as paying out up to 5000 times your original bet. The Diamonds are Scattered and can show up anywhere on the reels in order to win a payout of two or more, up to 100 coins. There is also a bonus Mines feature that is triggered when the Cave appears on Reel 1, and Diamond on Reel 5. Win your way to riches in this underground adventure, and find success in the Diamond Cave! Paying out up to 100 coins, the Diamond is Scattered. This means that two or more can show up anywhere on the reels in order to earn a cash payout. The Cave is Wild and can be subbed to become any other symbol on the reels, except Diamonds, and pay out up to 5000 times your bet. 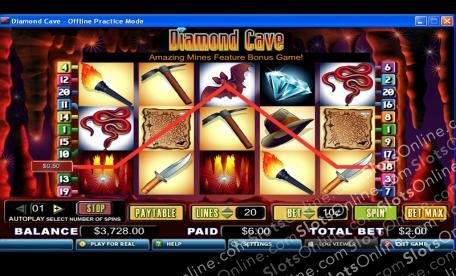 Land the Cave on Reel 1, and the Diamond on Reel 5 to enter the lucrative bonus round set in the thrilling Mines!